A record 99 books of murderous intent are in contention for Sisters in Crime Australia’s 17th Davitt Awards. Sixty-three are adult crime novels. Davitt judges’ wrangler, Jacqui Horwood, said women’s crime writing had exploded over the past 17 years. “When the Davitt Awards were set up back in 2001, there were only seven books competing, though admittedly non-fiction crime books weren’t then in contention. A fourteen-fold increase in 17 years almost requires suspension of disbelief. This year the number of books in contention was within spitting distance of a lovely round number,” Horwood said. “What’s also apparent this year is that women’s crime is not just stalking the mean streets of Australian cities. It’s crossed the paddocks to striding down the dusty backroads of rural Australia. Books such as Jane Harper’s The Dry (Pan Macmillan Australia) and Emily Maguire’s, An Isolated Incident (Pan Macmillan Australia) have found large and appreciative readerships. Rural settings are particularly popular with romantic suspense authors such as Bronwyn Parry and Fleur McDonald. Horwood said that a number of authors were aiming for an international audience. “Australia is such a small market that the temptation to target the large US and UK markets can be overwhelming. Tell the Truth, Shame the Devil (Penguin Random House Australia), the first adult crime novel by well-known YA author, Melina Marchetta, switches between UK and France. Caroline Overington (The One Who Got Away – HarperCollins Australia) has opted for California as the scene of the crime,” Horwood said. Six Davitt Awards will be presented at gala dinner in Melbourne in August or September: Best Adult Novel; Best Young Adult; Best Children’s Novel; Best Non-fiction Book; Best Debut Book (any category); and Readers’ Choice (as voted by the 600 members of Sisters in Crime Australia). The Davitts, named after Ellen Davitt, the author of Australia’s first mystery novel, Force and Fraud, in 1865, cost publishers nothing to enter. Previous Davitt Awards have been presented by Australian crime writer Liane Moriarty (2016); UK crime writer Sophie Hannah (2015); South African crime writer Lauren Beukes (2014); New Zealand crime writer Vanda Symons (2013); Swedish crime writer Asa Larsson (2012); Singapore crime writer Shamini Flint (2011), Scottish crime writer Val McDermid (2003 & 2010); Justice Betty King (2009), Judge Liz Gaynor (2008); Walkley-winning investigative journalist Estelle Blackburn (2007); true crime writer Karen Kissane (2006); Sisters Inside’s Debbie Killroy, (2005); US crime writer Karin Slaughter, (2004); ACTU President Sharan Burrow (2002) and Chief Commissioner, Victoria Police, Christine Nixon (2001). 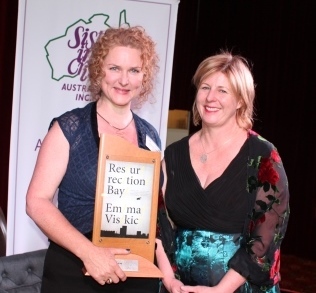 Sisters in Crime Australia was set up 26 years ago, has chapters in different states and holds regular events in Melbourne dissecting crime fiction on the page and screen. It also hosts a popular annual short-story competition, the Scarlet Stiletto Awards. The Davitts apply to books published the previous calendar year. Voting by Sisters in Crime members on the Davitt (Readers’ Choice) closes on 31 July. A short list will be announced in mid to late July.